Jacopo Bellini (c. 1396 - c. 1470) was an Italian painter. Jacopo was one of the founders of the Renaissance style of painting in Venice and northern Italy. His sons Gentile and Giovanni Bellini, and his son-in-law Andrea Mantegna, were also famous painters. Born in Venice, Jacopo had been a pupil of Gentile da Fabriano. In 1411-1412 he was in Foligno, where with Gentile he worked at the Palazzo Trinci frescoes. In 1423 Bellini was in Florence, where he knew the new works by Brunelleschi, Donatello and Masaccio. Many of his greatest works, including the enormous Crucifixion in the cathedral of Verona (1436), have disappeared. From c. 1430 is the panel with Madonna and Child, in the Accademia Carrara, once attributed to Gentile da Fabriano. In 1441, at Ferrara, where he was at the service of Leonello d'Este together with Leon Battista Alberti, he executed a portrait of that Marquess, now lost. Of this period the Madonna dell'Umiltà, probably commissioned by one of the brothers of Leonello. 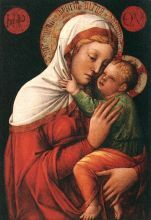 The influence from Masolino da Panicale towards more modern, early Renaissance themes is visible in the Madonna with Child (dated 1448) in the Pinacoteca di Brera: for the first time, perspective is present and the figure are more monumental. Later he contributed with works now lost to the Venetian churches of San Giovanni Evangelista (1452) and St. Mark (1466). From 1459 is a Madonna with Blessing Child in the Gallerie dell'Accademia.